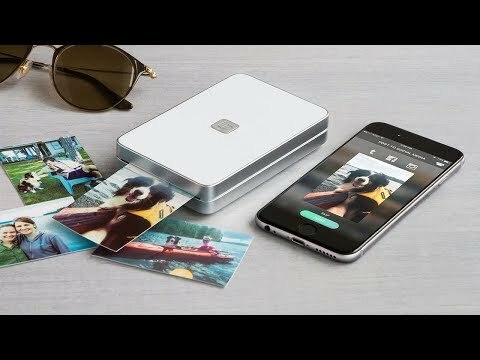 Lifeprint is a pocket-sized, ink-less portable photo and video printer that creates prints straight from your camera roll and social media accounts. Its augmented reality feature is straight from the future. If you print a video still, you can watch the actual video from the companion app by just hovering over it. Snap a pic and then count down 30 seconds as it almost instantly turns into a glossy, high-res picture you can keep (and watch) forever. Dimensions: Regular: 4.6" x 3" x 0.9"; Large: 1.1" x 4.6" x 6.3"
Weight: Regular: 0.4 lb. ; Large: 1 lb. 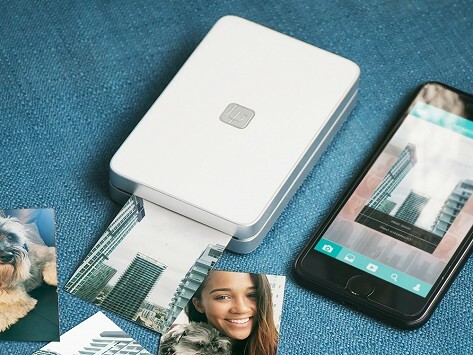 This is a great little printer! I have Samsung Galaxy Note 8 and the pictures are clear as ever. I found that I wasn't ever printing pictures anymore because I had them all on my phone or laptop and didn't need to print them. But if I wanted to show anyone a picture of my son or my pet... I didn't always have what I wanted with me. So this is the perfect wallet photo! The printer fits in my purse and prints in a minute or so.